We simply had the most fantastic Christmas at Larks Leas Rest Home this year. Reindeer and camels are the animals traditionally associated with Christmas, but not in 2018! 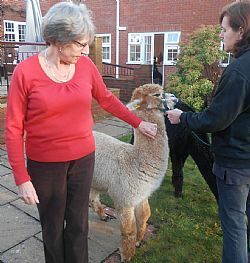 There was a new furry friend trending this Christmas, the festive Llama, and we were lucky enough to have them visit our care home in Blandford and spend time with our residents. We had lots of fun over Christmas with the arrival of our Mother Christmas and her elves, some wonderful food prepared by our care home chefs and exceptional cupcakes made by one of our Directors, Jules. We also had a lovely visit from our local primary school in Blandford who sung us lots of Christmas carols. Larks Leas Rest Home wish everyone a very happy new year!